This week I had a request from my husband to make an old favorite that we haven’t had for a while. This stew is different from anything else I make because it uses a whole head of garlic. Now, if you’ve tasted my baba ganoush, you know I can tolerate some garlic. But even I couldn’t stand 15-20 cloves, except for one thing–they’re not chopped. Cooking them whole mellows them out much like roasting does, so when you bite into one, you still get the garlic taste but in a milder, creamier version. 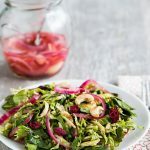 One of the best things about this recipe is that there’s nothing “weird” in it–meaning, you probably have all the ingredients in your pantry, and if not, you can easily find them in any grocery store. Give it a try and I promise you will be amazed at how delicious a whole head of garlic tastes! Cooking garlic whole gives it a delicious, mellow flavor. Try it! Break the garlic bulb into cloves and peel off the skin. If you’d like, chop one of the cloves, but leave the others whole. If some of the cloves are very large, you may cut them in half lengthwise. Heat a large, non-stick soup pot. Add the onion and sauté until it turns a rich, medium-brown, about 5 minutes, adding a tablespoon of water if it begins to stick. Add the garlic and carrots and sauté for 1 more minute. Add the beans, tomatoes, bay leaves, and water. Cover the pot and simmer for about an hour, adding water if it gets too thick. Stir in the salt and pepper. If you’re serving the stew right away, add all the parsley and the lemon juice. If you’re serving it later or at room temperature, add the parsley and lemon juice right before serving. Susan — I’m thankful you will be posting the “good for you” stuff in excess for a while. I’ve also grown out of my skinny-guy clothes, and would very much like to wear them again. I’m also sick, and I attribute that largely to being unhealthy and on the fat side. So, while I’m not happy you feel the need to lose weight, I am happy that I’ll benefit from it! I also have been too dependent on tofu and carbs. Save me from my pasta and rice! Thank you for all your work/ideas they are GREATLY appreciated! Yum–this looks great, Susan! I like the idea of whole cloves of garlic in the soup to mellow out their flavor, too. Kind of like roasting it. I love garlic!! I appreciate you being respectful of the upcoming swimsuit/shorts season. I need to stick to healthy eats as well for the next few months, so I’ll look forward to your upcoming recipes. And honestly, Susan, all your posts are great, the sweet and the savory. The bean stew looks really tasty and filling. It will be a true test of how much I love garlic! I love garlic. I would add 20 cloves to any recipe and scare people away. The bean and garlic stew looks great. I’m really happy that you are sticking to the healthy foods and helping us all get ready for summer. Lol! 🙂 Your food is SO good that you do not need to compromise and add the fat. I forgot to mention in your last post that I laughed at your tag line of “Shameless Self Promotion” Lol! You’re too cute. 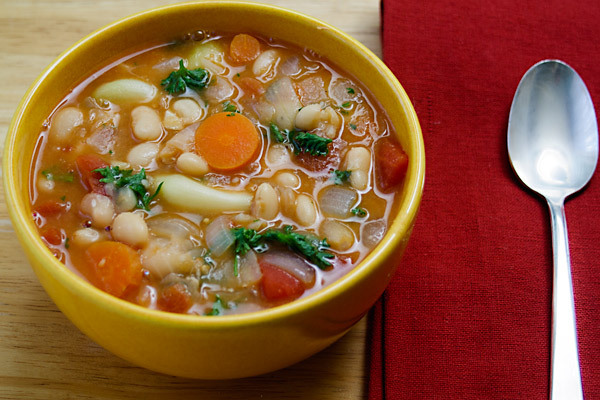 I love both garlic and white beans, this stew looks so tasty and yummy! I am going to try it soon! I also love your blog and recipes, photographs! I have found the recipes I have tried from your blog are very tasty and delicious and I wouldn’t hesitate to try any of them, anytime. Your blog is great Susan! I hope you don’t ever change! I love that your focus is fatfree vegan, and you’re one of the blogs I subscribe to that I would never cancel because I love looking at both your photography and I love the recipes. I’ll add my voice to those thankful you’re sticking to the whole grains, beans, fruits, and veggies for the next few months. For me, it isn’t about the weight, but a new committment to eat healthy. I listened to a recent vegan freaks podcast, the only one they’ve done about health, and it really made me think about my food choices. Even though my eating habits are not that awful, vegan junk food is still junk food, and “sometimes” has a tendancy to come more and more often when you’re not paying attention! So I’m happy enough to be inspired and avoid temptation at the same time. Your pictures and stories always make me want to run to the grocery store and start on the recipes right away! This looks delicious. I’m going to add kale to mine. I *finally* got around to posting photos of the vegeroni- have I thanked you for this recipe yet? I can finally say “I’ve made seitan from scratch.” It’s a great feeling. To everyone here interested in better health and/or losing weight, the other part of the quotient is activity. Exercise. If you try to lose weight by diet alone, at some point your body decides you are starving and manages to get by on fewer calories. So weight loss stops. This is a throwback to surviving during times of scarcity and even famine. In an interesting sidebar, people who’ve adopted the extreme calorie-restricted diets in their quests for longer lives take in so few calories that they literally cannot do things like swim or ride a bike. They just plain don’t have the energy to do it. And they call that living? So the key is balance: Watching what you eat and getting exercise. In the end, weight loss really comes down to burning more calories than you consume. Period. I just wanted to say thank you for the wonderful soup recipe. I was at a loss yesterday, as to what to make for dinner and when I saw this recipe I knew. I love that fact that it is an overall quick and easy to prepare dish, but it looks and smells like something that takes hours. Anyway, I made the soup and served it with some toasted potato and rosemary bread and it was fabulous! P.S. I did make one alteration, I used veggie broth instead of water. this is definitely my kind of food! I’ve got a big thing of homemade veggie broth to use up, so maybe I”ll make this in the next couple of days. i think your emphasis on whole foods is wonderful – it’s one of the things I really appreciate about your recipes!! i vote for you,i think your blog is amazing! 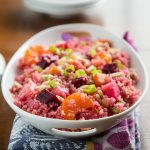 I love your blog, so I’m excited that you will be posting ever more “good for you” recipes, as I’vve recently become vegan-ish (still working on bread, etc.) and have quite a bit to lose. Your recipes will give me some extra help and incentive to do the right thing. Your pictures are all so pretty! Unfortunately my grifriend HATES garlic, i know i know! Reading all the kudos, I must add mine. I discovered your blog about 3-4 months ago and have enjoyed it immensely for its wit, writing style, photography and content. I have been a vegetarian for years, but never thought a vegan diet was really plausible. Well you have proved that wrong. Several days ago, I thought I’d start reading your blog from its earliest days. I saw so much growth. Though your photos in the early days were fine, they are now supremely artistic and enticing. The light banter of your writing is much appreciated too. thank you for my favorite blog. This is perfect timing! I just had a hankering for some cannelli beans. I think I’ll add some kale too to give my veggie deficient family a boost. Your blog is great. I’m committed to trying more of your recipes as I want to show my diabetic dad how healthy a lowfat vegan diet can be (with the hope of helping him restore his health). The dish is very similar to a Turkish dish called ‘piyaz’ … it’s an absolutely delicious staple & served both hot and cold! 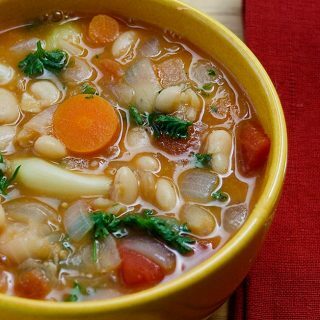 I adore a simple bean soup like this one. Anything goes: celery, zucchini, pepper. But my favorite veggie in a white bean soup is kale. Thanks for posting this! Great recipe. It turned out really well and was super fast. Yummy for the tummy. Man, it doesn’t get much better than cooked garlic cloves, does it? This soup was really easy and really delicious. We added a few handfuls of kale and a little extra veggie broth (instead of water). Thanks, Susan. Will be making it again soon! Susan – far from limiting, I find the amount and quality of recipes that fit your critera astonishing and inspirational! and from these comments it looks like I’m not the only one. 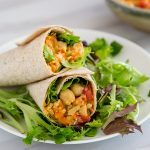 When I started on Weight Watchers last month I was elated to come across your blog in my search for healthier vegan recipes. I tend to be a “carbitarian” so including more vegetables in my diet is a high priority. Your recipes have really helped me do that. The food is delicious and attractive enough that my non-veg boyfriend enjoys them and I don’t feel the least bit deprived. I made this for the first time this evening. Very, very pleased with how it turned out. I’m usually not a fan of homemade soups, but this is delicious! Thank you! i’m from biloxi originally and my family is still there (actually, my sis is in the jackson area). anyway, my husband and i are trying the veg lifestyle and when i ran across this i immediately thought of my daddy’s lima beans and rice!! the only difference is no ham or sausage. it is already rainy and cold here in the northwest, so i decided to give it a go today for lunch and it was absolutely FANTASTIC!!! the only thing i did differently was add a bit more veg. stock to the pot (i only use organic veg. stock anymore in soups and rice/grain dishes). it used up the rest of the container and made it a bit more soupy. and the best part was, i was right. it reminded me of daddy’s limas. so, even though it made me a tad homesick, thanks so much!! What a great recipe!! I made this the other night but did change it a bit to suite that nights craving. I loved using all those garlic cloves you suggested – so yummy and they literally melted into the stew! Delicious. I used chickpeas because I had just soak a huge batch. I also added some cinnamon sticks, turmeric and red pepper flakes because I was in that kind of mood. I let it simmer to a thick consistency (more like beans & veggies & tomato, instead of soup ) and served it over bulgur. Next time (soon) I’ll probably make it more like soup, without the cinnamon & tumeric. Sooooooooo yummmmmy!! This recipe was wonderful. I just made a double batch and it satisfied everyone in our eclectic household. I substituted a cup of frozen peas for half the carrots, and used two little multiplier onions (I’m not big on onions). I also added a couple handfuls of chopped spinach and some dried rosemary. All these changes come highly recommended! Yummy. I made this tonight and it is..oh, so wonderful. I left out the tomatoes, since I’m allergic to them and increased the water to make up for it. I also added some kale. I guess i cooked it too long (or long enough!) as the garlic melted and there were no cloves in the stew. I love garlic but there was no strong garlic taste. Thanks!! This recipe was so easy, fast and delicious. Even my 11 yr old dasughter liked it and said it tasted sweet and mild. Mmmmm… made this again tonight! I stuck to your recipe this time but added extra veggies that I happen to have on hand (bok choy and chopped kale). Love the mild sweetness all the garlic gives it. LOVE this recipe. Sorry, had to gush! I made this the other day and used 15 garlic cloves instead of the 20. I will use 20 next time. They were sweet and mild and did not lend an overpowering garlicky taste. The recipe was delicious and I will make it over and again. Don’t ever quit photographing the recipes. That is the main reason I am trying them plus your reputation for being a fabulous vegan cook of course. Thanks and keep them coming. This is the ultimate sick day food. I am trying to recover from this horrible virus and haven’t had anything unclog my head like this fabulous soup. Thank you so much, I feel like its going to heal me. I am getting married in a month and I need warming recipes like this that are going to help me fight away the inevitable winter kilos. I made this for my mum and dad tonight and it was just fantastic. I put in veggie broth instead of water and put in some baby spinach leaves. It was just divine!!! Thanks for all your amazing recipes. I tried this today, but I used kale instead of parsley. It was very good. Thanks for all of your great pictures and recipes! I never liked cooking and since I’ve became vegan and try to eat only organic foods I had given up on it all together but so far I’ve tried two of your recipes (this one and the ridiculously easy lunch box Mexican casserole) and I’ve been very happy with the results! So thanks and keep up the great work! I’m making this recipe for the second time. I am so happy it exists because it contains pantry staples and veggies that I pretty much ALWAYS have on hand. I can’t tell you how many times it has saved me days before payday when we didn’t have too much left. Is this the forum in which you found this recipe. Either you got it from them, or they got it from you. It’s cooking right now and smells divine. Trying to decide whether to use parsley or cilantro. I am addicted to cilantro. 3fatchicks took the recipe from me, Anon. My recipe was adapted from one that started with dried beans and I changed it significantly before posting it here. The original recipe came from someone on the Veglist email list. Unfortunately, all those messages aren’t archived anywhere for me to find the original poster and thank them. This is one of my favorite stews. Hope you enjoy it! I just wanted to drop by and tell you that I made this recipe when you first posted it in 2007 and have been making it often ever since. Whenever there seems to be little food in the house and I have a full head of garlic on hand, some variation of this soup usually is what makes it to the table. I usually use chunks of potatoes instead of the brown rice. Mmmmm…. I think I’ll be making your lasagna next! Thanks again. This is an absolutely DELICIOUS recipe. We make it at least once a month and enjoy it every time – especially good with crusty bread and a glass of cabernet!!! This is delicious! I added a little bit of “better than bullion” and some extra water but I don’t think I needed to do it. I halved the recipie but am wishing now I had made the whole thing so I could enjoy more leftovers! I can’t wait to try this. I think I will make it tomorrow or Saturday and see if I can convert it to the slow cooker! I soaked my beans last night and am making this today…it looks like it would make an excellent crock-pot dish. Just combine everything into the crock and let it cook until the veggies are tender. If I wanted to make this with dried beans, what kind of amount would I need to use? I think you will need about 1 1/2 cups dried beans and 3-4 cups water, but check it often to see if it needs more water. Soak the beans overnight after measuring. Just writing to say- I have made this recipe more times than I can count in the past 6 months, and I *love* it. Even my meat-and-potatoes boyfriend requests it. 🙂 It has definitely become a staple in my house. I made it first exactly as written, and it was fantastic, but of course I had to experiment! I tried it with both parsley and kale, and found that for us it was good with either on the first day but the greens did not seem to hold up in the leftover soup, so now I make it without any greens and serve it with a salad. I also use dried beans that were soaked overnight, so I let the whole soup simmer for about 2 hours instead of one, and I have found we like it better with more tomatoes, so I usually double the amount listed. Thank you for such a great recipe! I made this today…So Good! I had roasted carrots and yellow beets that I needed to eat so I put them in and I added crushed red pepper and used watercress instead of the parsley because I Love watercress, and parsley not so much. It is delicious! This stew had me imagining myself as a French peasant. Simple, nutritious, good, and oh so garlic-y. I served it over half of a small baked potato, and with some red wine. Just what I needed for these chilly autumn nights (the second night’s bowl was the best). I might try cilantro next time as my herb of choice rather than parsley. **BTW…I did try a couple spoons, before I added the parsley and it was super yummy !!! For sure something I will make over and over again !! THANK YOU SO MUCH FOR THE RECIPE !!!!!!!!!!!!!! So glad I found this site! I love to cook and being a new vegan, this is a great place to find tasty recipes! I made this today and although I did not have the onions or the carrots and I’ll admit I was skeptical about how it would turn out but I have to say, it turned out to be very very tasty. Even my husband who is and always will be the farthest thing from being vegan, enjoyed it, he even had seconds :). I used potatoes instead of carrots and thew in some peas for good measure, I tweaked the amounts a bit and added more water. I also did not have any cannellini or great northern beans, so I used kidney beans instead.. O.K, so maybe it’s a whole new recipe..lol but you have inspired me to start cooking healthier and eating better. wow Susan! I love your recipes! You know what to do with spices and your recipes, thus far, have all been wonderful!!! I am a vegan as well-decided to go back to that in August. I used broth instead of oil, and I didn’t have fresh parsley so I used dried. This is an incredibly flavorable recipe. We had it tonight, and my husband asked if we can have it again tomorrow. 🙂 Thanks so much. Love this. I added some small potatoes and some escarole to make a stew. Pretty tasty. Wow is this a great recipe and so easy to prepare! My college age daughter went nuts for this! Thank you Susan!!!!!!! Making this (again) tonight for the starting-to-get-a-scratchy-throat boyfriend. If this doesn’t fix him, I don’t know what will. LOVE this recipe! Can this be made in an electric pressure cooker? What adjustments would need to be made? Anne, do you mean using cooked beans, as I do here, or using dry beans? For cooked beans in a pressure cooker, just follow the recipe and instead of cooking for an hour, pressure cook for about 8-10 minutes. I can’t promise that the flavors will be as strong as for a slower cooking, so feel free to add additional seasonings. Dry beans would require more liquid and a longer cooking time, so you would need to experiment. This sounds NICE! Will make it soon . . .. I love your recipes and use them often. However, bay leaves are something I can never get where we live. I just proceed without them, but I wonder what I’m missing, especially when a recipe calls for 2. I may order some online but not sure of what I’d end up with or if the expense is worth it. Could you advise? Emily, bay leaves don’t have a strong flavor to me, though my husband says he can taste them, so I continue using them. But if it were up to me and I had trouble finding them, I would just leave them out. Now, that’s just me and other people may think they add a lot of flavor, but I think at least in this stew, there’s so many other flavors that you wouldn’t miss them. I just made this as my go-to lunch for the week. I had to substitute chick peas and navy beans for the cannellini beans because I was out. This is SO good!! I can’t wait to make it again with cannellini beans. Thank you for re-posting!! 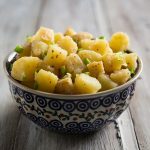 I lOVE garlic and cannot wait to try this recipe! 🙂 Just hope my family loves garlic as much as I do. Oh my goodness can I just say how happy I am to have found your page!! I recently have been diagnosed with gull stones and have had to completely change my diet. Your recipes have saved my life literally!! I’m able to enjoy food again and I don’t get gullbladder attacks anymore!! My husband who is very picky Also loves your recipes!! Thank you so much for taking the time to put all this together!! Susan, how would you modify this recipe to prepare it in an electric pressure cooker? I love mine and find the ability to set it and then play with my two young children while it cooks to be so valuable. I am not a vegan nor a vegetarian. No one in my family is. We love this stew. I like to make a double batch, and pack it in individual servings that I can just grab and take for lunch at work. We make it simply because of the great taste, it is filling,healthy, and delicious. The ingredients are simple, and I usually have them all in my pantry. It is so nice that it is also economical. Feeding a family of five can get expensive! Even if you are a meat eater, I think it is good to have all veggie meals to serve occasionally as an alternative. You definitely don’t miss the meet and this recipe. Thank you so much for sharing!